In Windows, users can manually disable User Account Control (UAC) feature. With TweakUAC, this process will be easier and simpler. TweakUAC is a free software utility which allows users to turn UAC on or off, or suppress the elevation prompt that pops up to ask for user’s permission in the quiet mode. UAC is a security feature in Windows that forces all users and programs to operate with standard privileges to limit the damage if any fraud happens, and only run with administrator rights when necessary after getting user permission. Turn UAC off – Disable UAC completely and system will no longer display any elevation permission prompt anymore. User accounts with administrator rights will run with full administrative credentials. 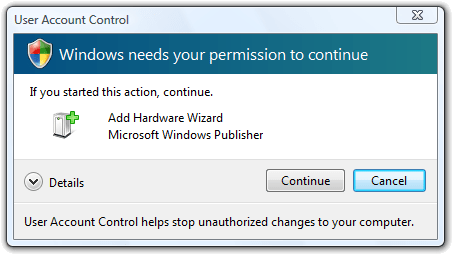 Switch UAC to the quiet mode – Suppress “Windows needs your permission to continue” privileges elevation prompt. When administrator users attempt to do an administrative task, the task will be allowed to proceed automatically without prompting. However, all other features of UAC is still enabled and enforced, such as the programs will run with the standard user permissions by default, and the standard users will still see the elevation prompts as quite mode only works for the administrator accounts only. Note: Quiet mode is actually set in Group Policy (see method 5) of UAC behavior as Elevate without prompting. Leave UAC on – Restore or switch back on UAC to the original behavior of UAC. To use TweakUAC, simply download TweakUAC (no longer available) and run it immediately. No installation required. And, you still need to confirm the UAC security warning if UAC hasn’t been disabled, and also confirm the EULA. After that, TweakUAC main screen will be displayed, where users can select their desired option, and press OK to set the state of UAC.